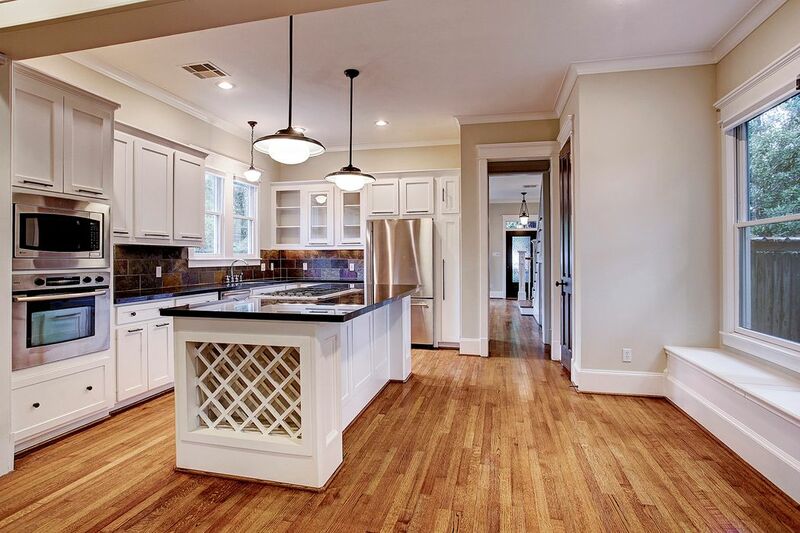 1224 West 25th Street, Houston, TX 77008 | Martha Turner Sotheby's International Realty, Inc.
Another veiw of the Kitchen and Family Room with a distinctive arch to separate the rooms. 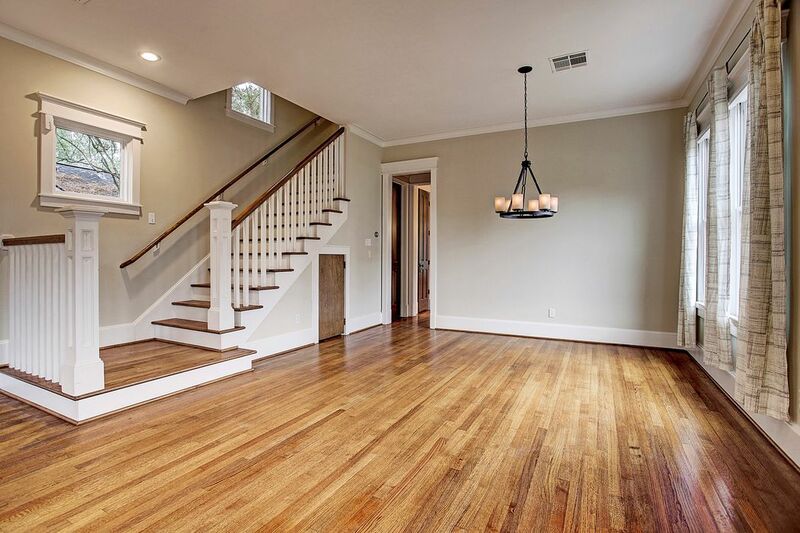 As you enter this charming home, you will note the striking reclaimed hardwood floors. These floors are continued throughout the entire home. 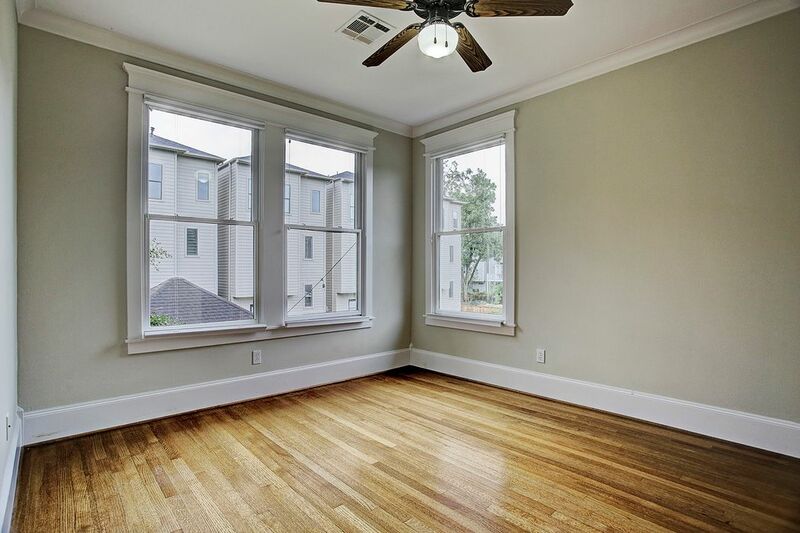 All windows are fully cased along with deep base molding and nice crown molding. This is a view of the Living/Dining room looking toward the front door and serene covered front porch. 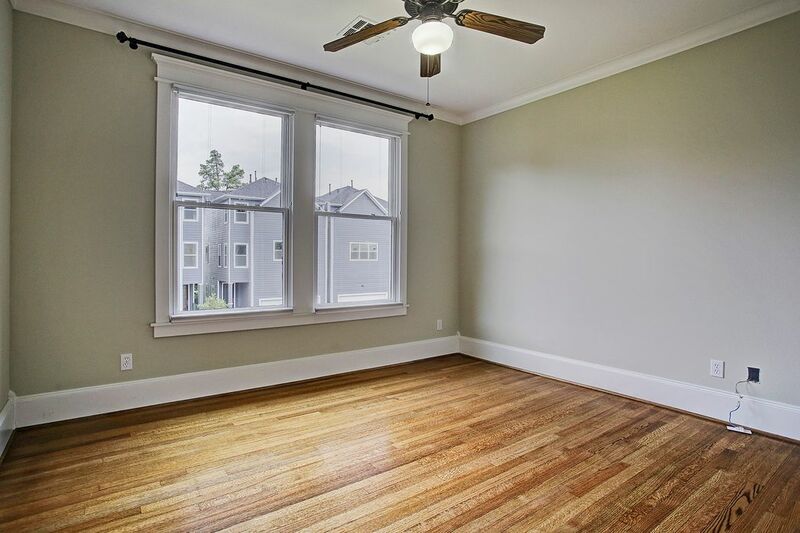 There is a ton of natural light in this room and throughout the house. If you like to cook, this is your Kitchen. It is well equipped with a over-sized island, Fisher & Paykel 5 burner gas range, pendant lights, built in microwave and great storage. 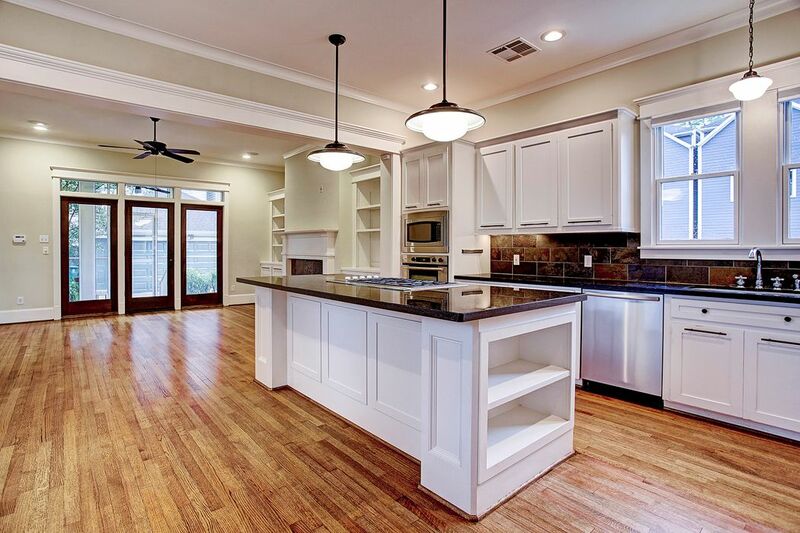 Neutral Kitchen has a built in storage bench on the right. It makes a great seating bench for a breakfast table. Large island has a wind rack built in. 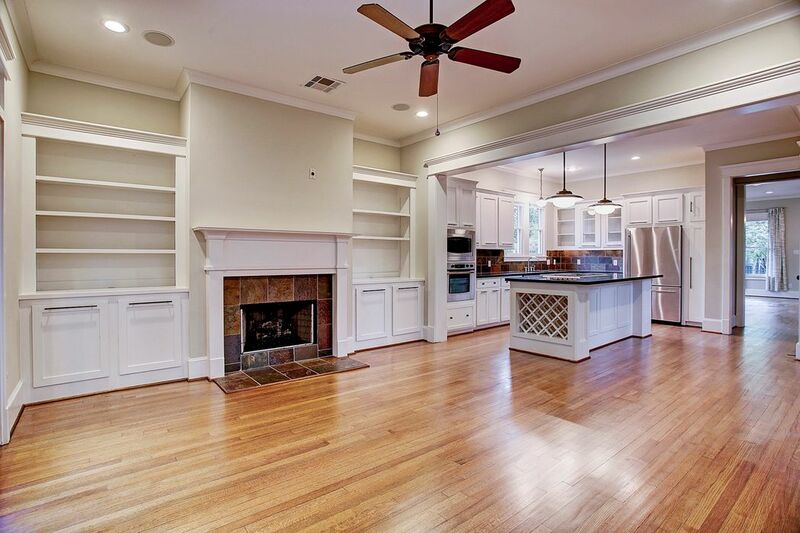 This view of the Kitchen shows how well it flows into the Family Room. 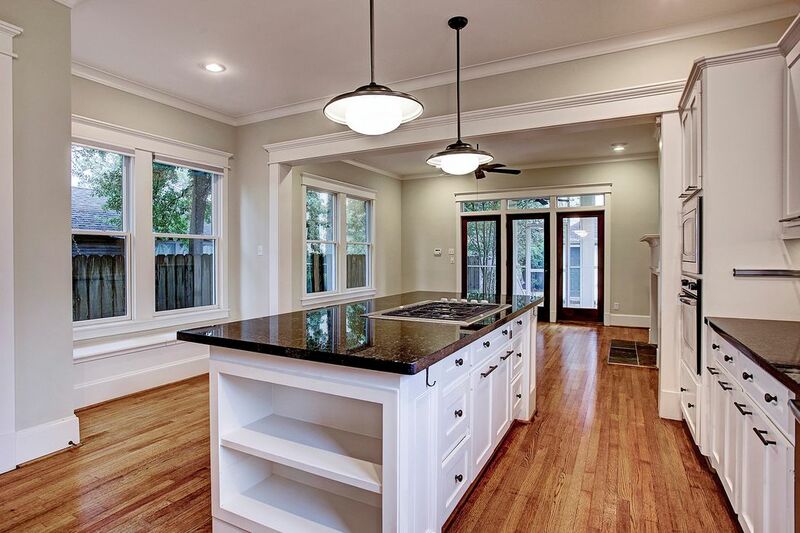 There is room for cookbooks and great granite counters. The large and open Family Room has extensive built-ins, ceiling fan, recessed lights, gas-log fireplace and a connection above the fireplace for a large TV. A closer view of the Family Room and screened-in back porch. 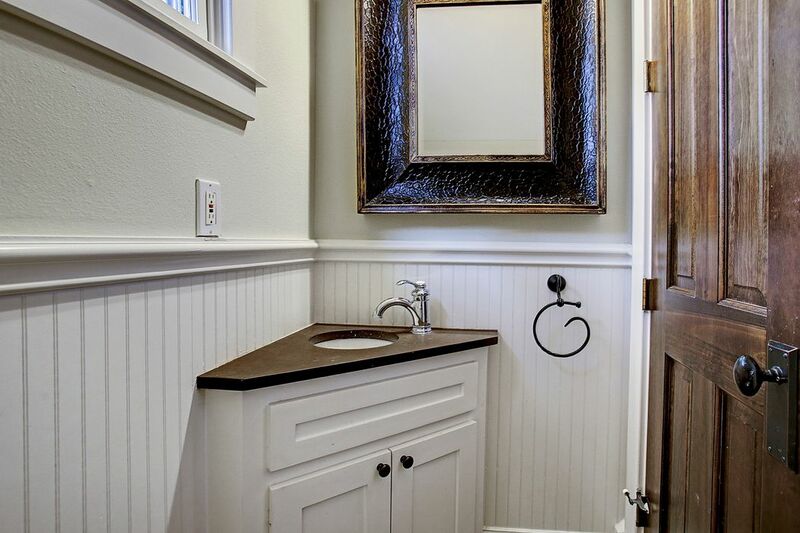 Simple but elegant Powder Room located on the first floor. 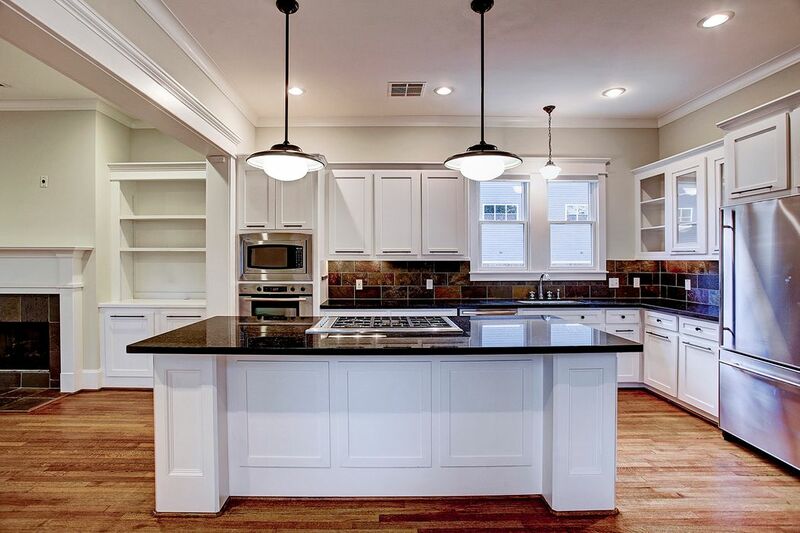 It features bead board walls, custom mirror and granite counter with under-cabinet. The Master Bedroom is located on the Second Floor and has tray ceilings, recessed lights and a ceiling fan. 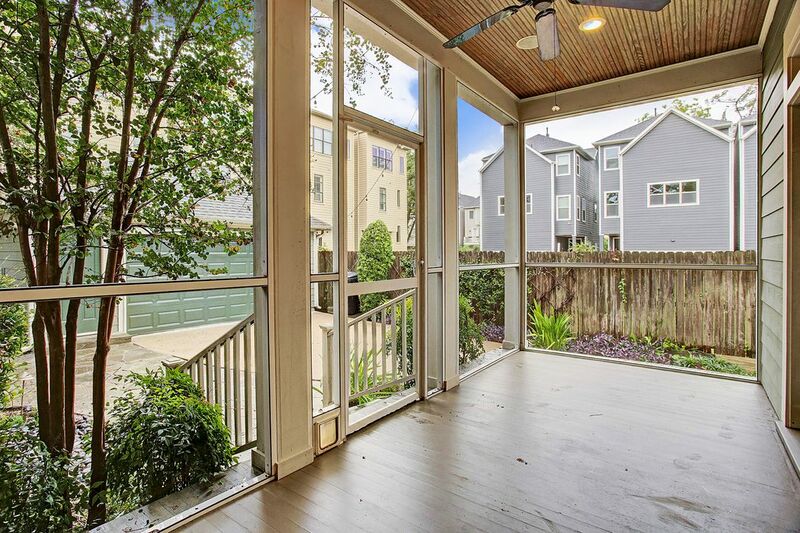 The front covered balcony is also screened in. 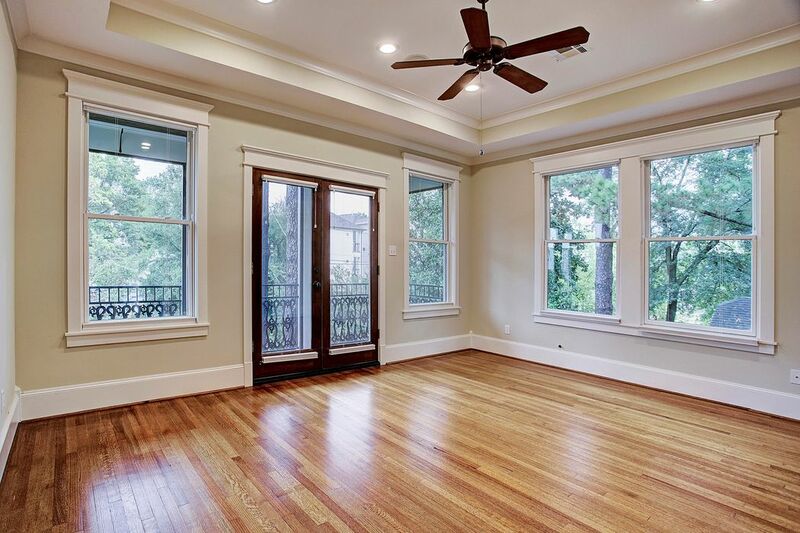 This room has an abundance of natural light and tree top views. 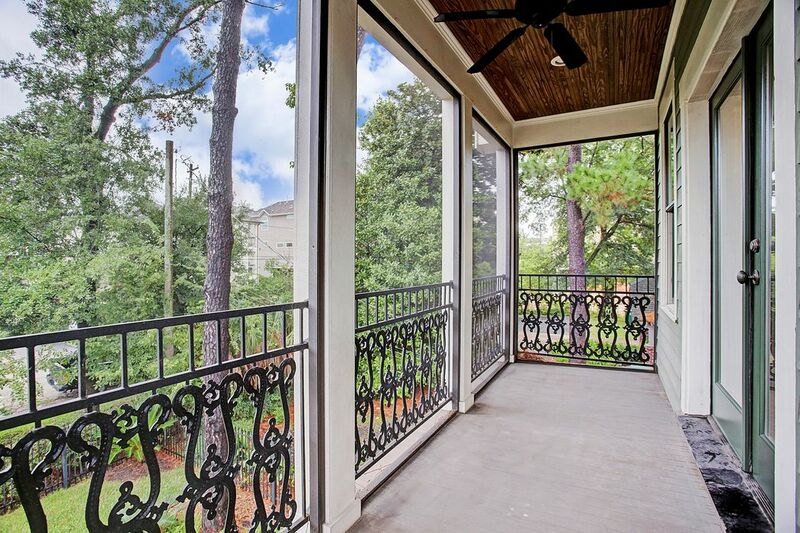 Take your morning coffee or a good book and enjoy this fabulous screened in porch off the Master Bedroom. 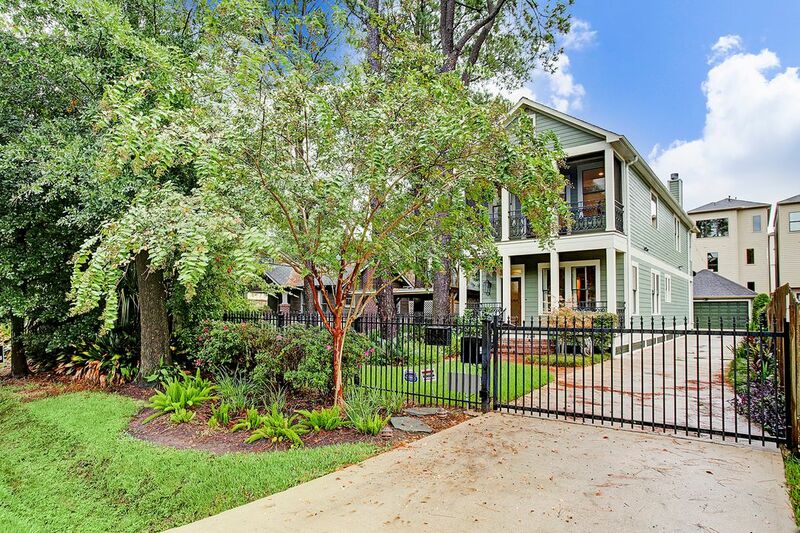 It faces the front of the house and looks out over the mature trees and landscaped yard. 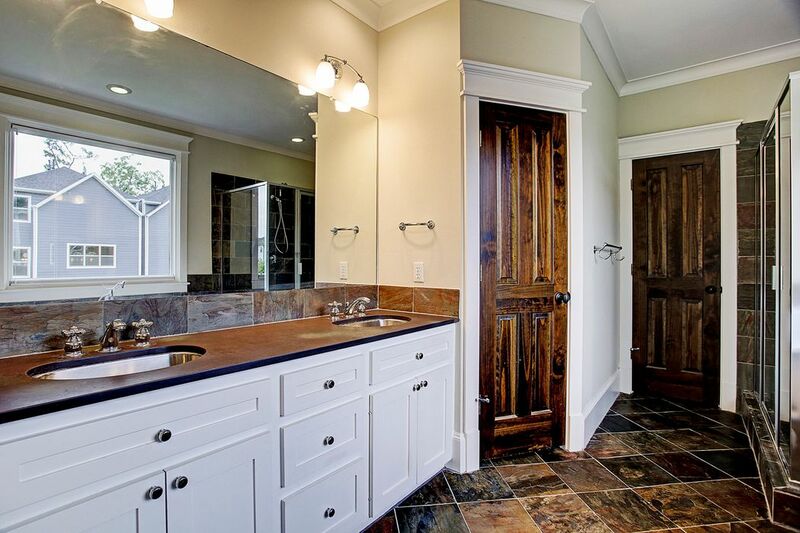 Large and luxurious Master Bath with slate floors and slate backsplash. 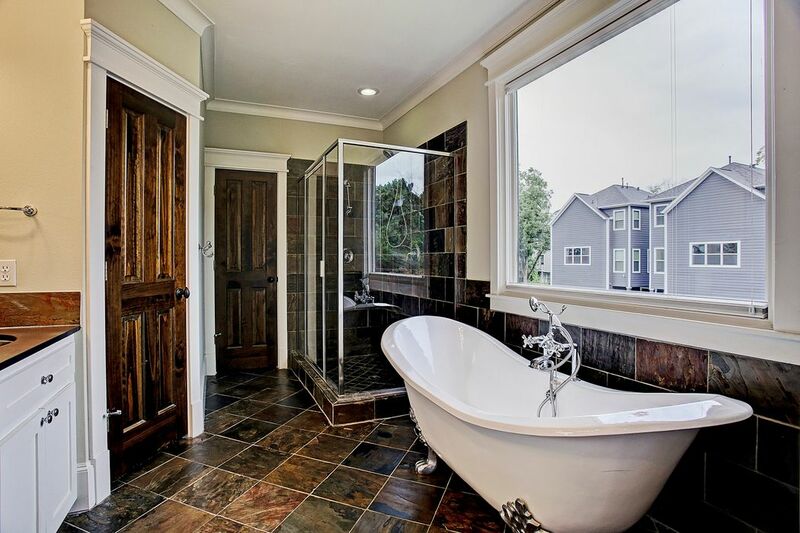 Take a step back in time with this claw foot tub. 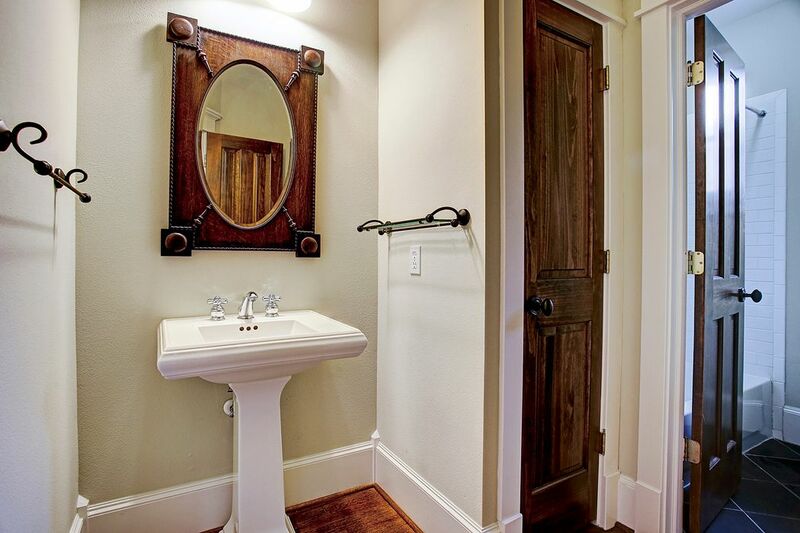 The Master Bath has double sinks, a separate shower and a large walk in closet. 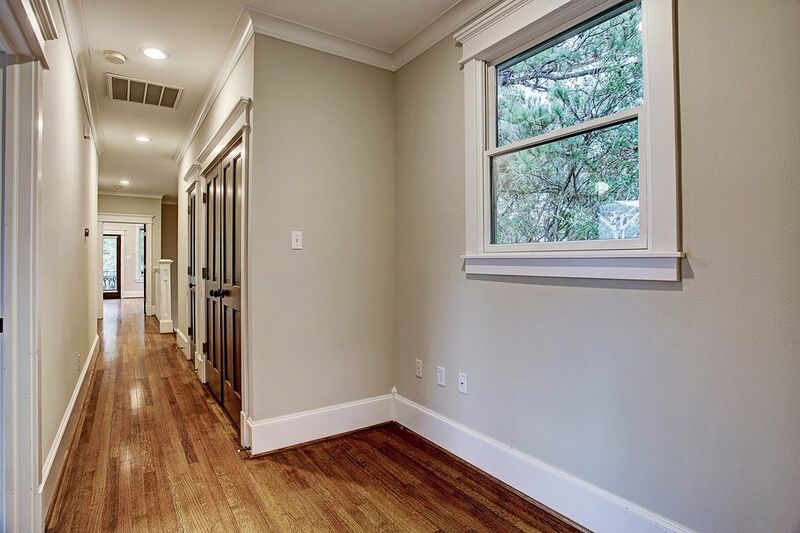 Included in the Second Floor hallway is a Laundry Room and a great flex space that could be used as a home office area. One of 2 secondary bedrooms on the Second Floor. Bedroom three located on the Second Floor. Secondary Bath located on the Second Floor has a tub/shower, great linen closet and a pedestal sink. At the rear of the property is a detached garage with work space, along with a great patio and garden. 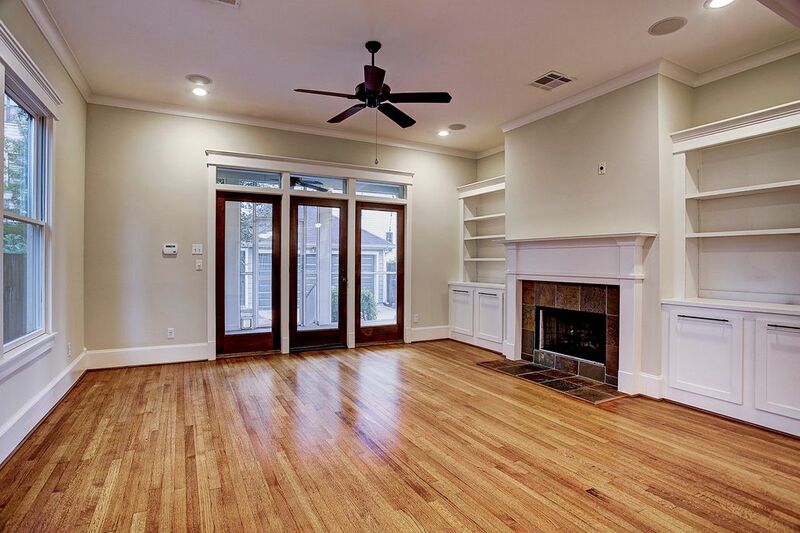 $565,000 3 Bedrooms2 Full / 1 Partial Baths2,420 sq. ft.
Charming custom home built by M. Bastian in 2003. 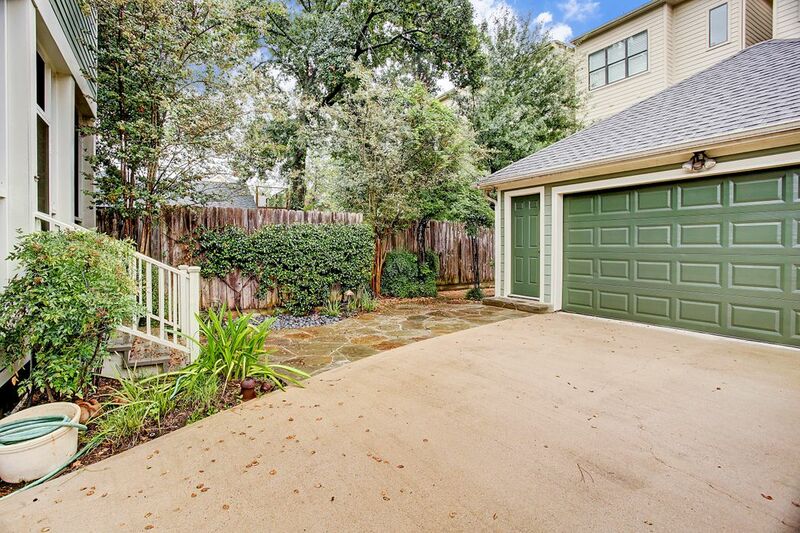 This quality home in Shady Acres sits on an approx. 5,250 sq. ft. lot. 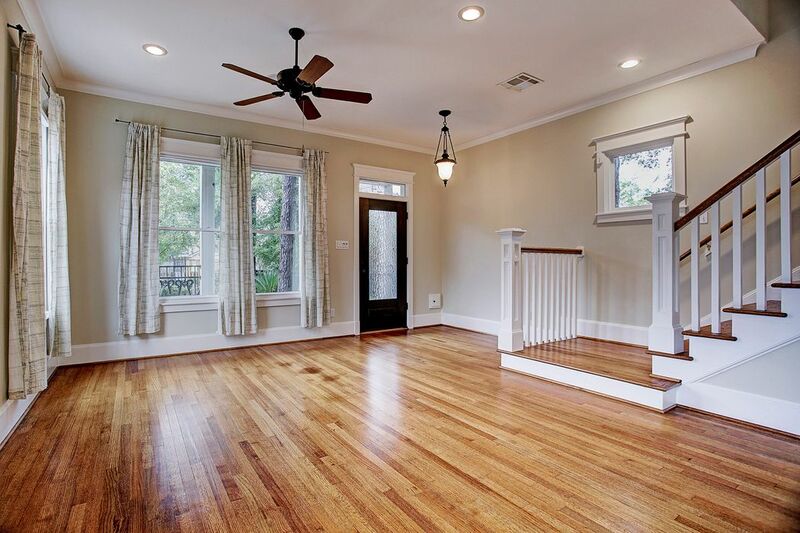 It has beautiful reclaimed hardwood floors throughout and 2 delightful screened-in porches. 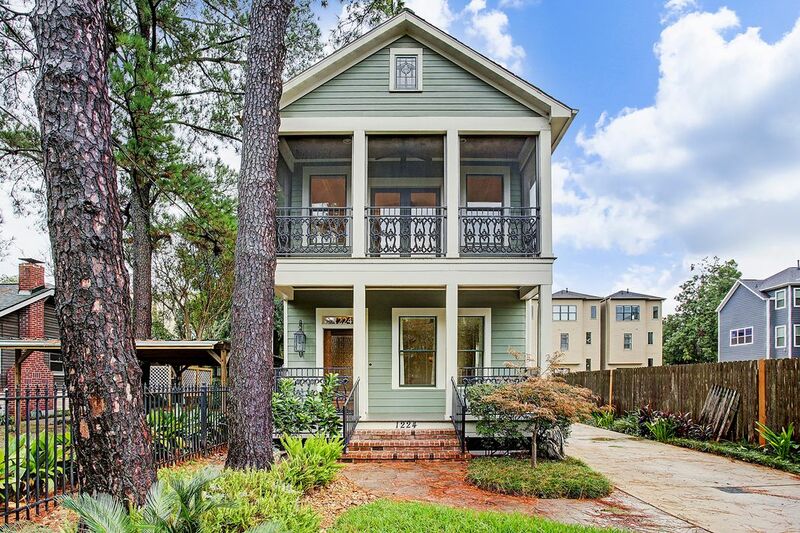 This home has a great front porch and a large, landscaped front yard. The entire property is fenced, allowing one to park multiple cars on the side and in front of the detached 2-car garage. Interior and exterior painted in 2018. Close to great restaurants and venues.